Why is it Necessary to Prevent Back Soreness, Musculoskeletal Damage and Lameness? 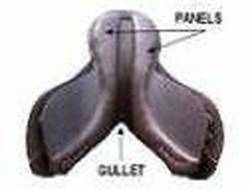 It is critical that your saddle panels are symmetrical and the foam or wool flocking is not hard, lumpy or bumpy. Otherwise, horse and rider back pain, musculoskeletal damage and even lameness can occur. An ounce of prevention is worth a pound of cure! Here are two quick "prevention actions" you can do now. Sign up to receive our free DIY "How to Inspect Your Saddle Panels" video. Read the important saddle panel information below the sign up form. new wool is placed inside the panels. Over time, the wool will compress and become hard, lumpy and bumpy need to be replaced. The saddle will also become unbalanced. By the way, in case you are wondering, the same issues arise with foam panels. Foam panels either need to be refoamed, which is quite expensive as it involves remaking the panels, or the foam needs to be removed and replaced with wool flocking. It is important that reflocking is done in a skilled manner so that the saddle panels are symmetrical, balanced and not too hard or too soft. Neglecting to reflock a saddle or an improperly flocked saddle can cause the same kind of muscular and skeletal pain, damage and lameness to your horse (and you as the rider) as an improperly fitting saddle. The quality of the material used to flock or reflock a saddle is very important. Holistic Horse Bodyworks uses only high quality, 100% natural wool to reflock saddles. Unfortunately, there are saddle reflockers and saddle manufacturers that use old carpet fibers, wood chips and other inappropriate materials. We have even found parts of used matches inside saddle panels! This can prove to be dangerous and painful for both horse and rider. How Do I Know if My Saddle Needs To Be Reflocked? Check out our short DIY video to learn how to check your saddle and determine if reflocking is necessary! Most saddles need to be reflocked every 2-4 years depending on saddle usage. What is Included in a Saddle Reflocking? What is Not Included? In addition to replacing the wool in the panels, we also include a free saddle safety check of the tree, the billets and the stitching. We will alert you prior to starting the reflocking if any saddle safety issues are present. We also include a flocking recheck within 6-8 weeks of the completion of the reflocking. Check out our Saddle Reflocking Information Sheet for additional information and for the terms and conditions regarding the reflocking recheck. IMPORTANT NOTE: Maintaining the wool flocking inside your saddle is an important component of your horse's health, but it does not mean the saddle fits your horse properly. Even a brand new saddle that has been well flocked may not fit your horse. If you have questions or concerns about proper saddle fit, Holistic Horse Bodyworks is happy to assist you. Saddle fitting is not automatically included in the saddle reflocking services or rates. Saddle fitting and saddle reflocking are two distinct but related aspects of overall equine care. SaddleReflocking.com and Holistic Horse Bodyworks proudly offer free 15 minute phone consultations to help you determine if your saddle needs to be reflocked. Email us or call (503) 867-1023 to schedule a free consultation appointment. We accept saddles for reflocking from anywhere in the world. Contact us via email or call (503) 867-1023 for details and to arrange for your saddle to be reflocked. What is the level of experience of the saddle reflocker, and where did they get their training? What material will be utilized to do the reflocking? Will the old material in the panels be removed and new wool placed in the panel or will new material be added to the existing old material? How long will it take to get your saddle back? Is there any type of warranty offered for the reflocking? Is a saddle flocking recheck included in the price? Will you receive a written price quote and receipt for your saddle? Is the person doing the reflocking insured?